Yungtön Dorje Pal (also known as Yungtön Shikpo) was born in 1284 into a family of Nyingma tantric practitioners of the Len clan, in Tsongdu, south Central Tibet. He met Khenchen Sönam Senge at the age of five and from him received the refuge and lay precepts. He became a disciple of Zurchung Jampa Senge and entered the Ugpalung Nyingma Monastery when he was fifteen years old. Lama Zurchung imparted many teachings to him, including those of Mahayoga, Anuyoga, and Atiyoga-Dzogchen. Shangpa Shakbum gave him the Yamantaka cycle of empowerments and teachings, and he studied and practised under a great number of other notable masters, becoming a highly respected lama in his own right. He was an expert on Sutra and Tantra and composed an authoritative commentary on the Guhyagarbha, entitled The Clear Mirror. Travelling to China while still a young man, Yungtönpa performed a rain-making ritual at the Yuan Emperor’s court. When rain subsequently came, the Emperor rewarded Yungtönpa with considerable wealth and gifts, which he used as generous offerings to his masters and various monasteries. He accepted a consort at the request of his mother and, after the first child was born, took leave of his family in order to receive monastic ordination. He was named Dorje Pal. At this time he met the Third Karmapa, Rangjung Dorje, and received the full Kagyu lineage transmissions and the key points and oral instructions of Mahamudra and Dzogchen. He practiced in Tibet and also in Paro, Bhutan for many years and achieved the highest realisations. He spent time at the sacred mountain of Pungpo Riwoche, where he taught the famous Sakya scholar Yakde Panchen Tsondru Dargye. He taught a treatise that he himself had composed, outlining the different views of buddhahood in Sutra and Tantra. 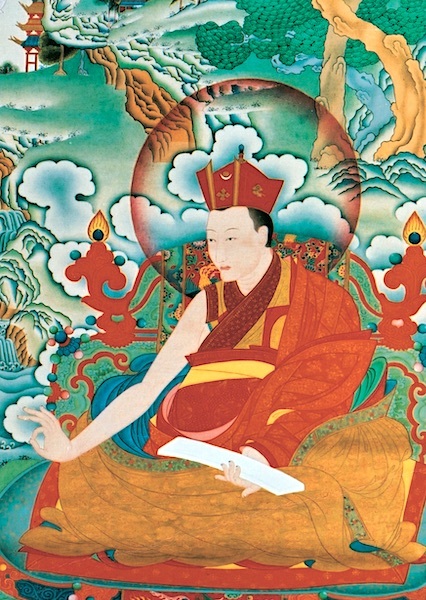 During this time, the Fourth Gyalwa Karmapa, Rölpe Dorje had been found and enthroned by Rinchenpal, in accordance with the Third Karmapa’s wishes. In 1352, at the age of fifty-six, Yungtönpa met Rölpe Dorje who was on his way to Central Tibet. Yungtönpa was convinced of the twelve year-old Karmapa’s authenticity after hearing of many events from his former life as the Third Karmapa. 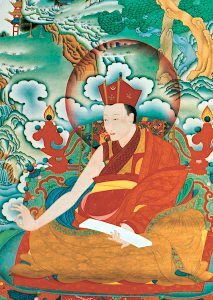 Yungtönpa subsequently bestowed upon the Fourth Karmapa all the teachings, empowerments and transmissions of the Kagyu and Nyingma lineages. Yungtönpa passed into Parinirvana at the age of eighty-two amidst many signs of his great realisation. He had many great disciples, but the main one who went on to hold the lineage was Rölpe Dorje, the Fourth Karmapa.